Is a cast aluminum chiminea the best chiminea type? A vast majority of chiminea lovers would say yes. The durable lightweight design appeals to almost everyone and they can add elegance and entertainment to a boring backyard. If your not searching for the traditional look of a clay chiminea but still want something that is light and functional, the cast aluminum type is definitely something to consider. Unlike a traditional clay chiminea that can be hand made, a cast aluminum model is made from a mold. This allows you to choose just about any style or model you want. Remember to choose a size that both accommodates your needs and blends in well with your backyard layout. Your chiminea can either be an accent piece or the focal point.....the choice is yours! A majority of the aluminum type chimineas will need to be assembled. The assembly process is pretty basic and can easily be accomplished. To start, choose an open, level base site. Never set up your chiminea on a wooden deck or other flammable surface without some sort of fire resistant barrier in place. Next, set your chiminea on a 3 or 4 leg base that's usually included with the unit. Never set the chiminea directly on the ground. Most users agree the 3 legged model is easer to balance, level and use compared to the 4 legged model. Look around to make sure there are no low hanging branches or awnings nearby. Once you pick the perfect spot and your chiminea is assembled and level....your ready to burn! As with all chimineas you're going to need to cure or season it before heavy use. 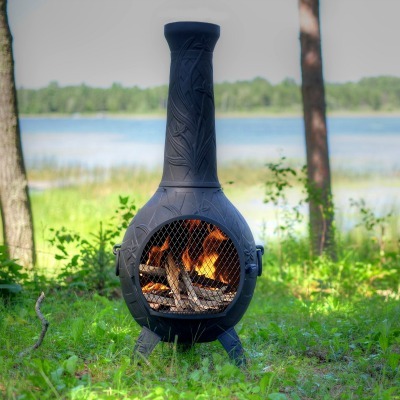 Why cure your cast aluminum chiminea? The process cures the paint allowing it to last longer. To start the curing process, build a couple of small fires with seasoned firewood and let the fire burn out on it's own. While the chiminea is still warm, build a larger fire and let it burn for about an hour. It's a good idea to put a screen over the top of the neck of the chiminea. This acts as a spark arrester and keeps hot embers from floating up and out of the chimney. These hot embers could potentially create an unwanted fire. To complete the seasoning process, let your chiminea cool naturally. As always, read the instructions included with your chiminea. This will ensure you complete all steps recommended by the manufacturer. If your looking for low maintenance and portability, the cast aluminum chiminea is arguably the best model available. Although chimineas are designed for outdoor use, a little extra care and maintenance will allow it to last a lot longer. One way to extend the life of you chiminea is to get a cover for it. Use the cover to protect the chiminea when it's not in use. If you live in an area that has drastic climate changes you may want to consider storing your chiminea in a barn or other similar building. Check your homemade spark arrester once a year to ensure it's still in tact and replace it when necessary. Also, some of the bolts and hardware used to assemble your chiminea may not be made of aluminum and could rust. Tend to the rust when necessary and your chiminea will last for many years and look great in the process.